Do you have a friend or family member who lifts others up with their acts of kindness? Do they just beam with goodness and giving? Do you feel inspired by their selflessness of helping others? Well, I want to hear about them. ​I have teamed up with 16 brands to do an act of kindness. We are playing the "Pay it Forward" game and want you to play with us. We will surprise 5 people with an awesome gift package mailed to their home. All you have to do is nominate someone that you feel would be a perfect fit for this game. I will randomly choose 5 people to receive a Pay it Forward package in the mail. Included in their surprise package they will receive a note that tells them why you nominated them for this game. I'll email you if your nominee won. ​Each Pay it Forward package is valued at $185. That is a $925 total donation for 5 AWESOME people. See below what shops and products are included in each gift package. Dylbug - "Eat the Rainbow" games + food cutters, Little June Shop - Hair bows, The Little Spoons - Cardigans, Bitsy Brain Food - Organic snacks, Robert And Stella - 5"x7" prints, Mark It With A Q - Leather wrap chokers, Dye Theory Threads - Hair bows + headbands, Maize And Maple - Baby moccs, Haylee Jamberry - Vinyl nail wraps, Landry's Lunches - Bento picks, sauce cups, veggie cutters + sami sealers, Lit Joy Crate - Children's books, book markers + posters, Sweet Sunshine Lane - Lip glosses, Baby Boy Bakery Kids - 1 month "We Cook" kits, Glass Works and Cheeks - Kids pajamas, Cheeks Lingerie - luggage tag, lingerie wash, voluspa candle, slipper socks, or eye mask, Care Crate - Taffy treats. Paying it forward can be as big or small as you would like to make it; from helping a an elderly person with their groceries to buying a meal for a stranger or bringing flowers or baked goods to a neighbor. The aim is to simply put a smile on someone else’s face and feel good about what you’ve done for someone else. 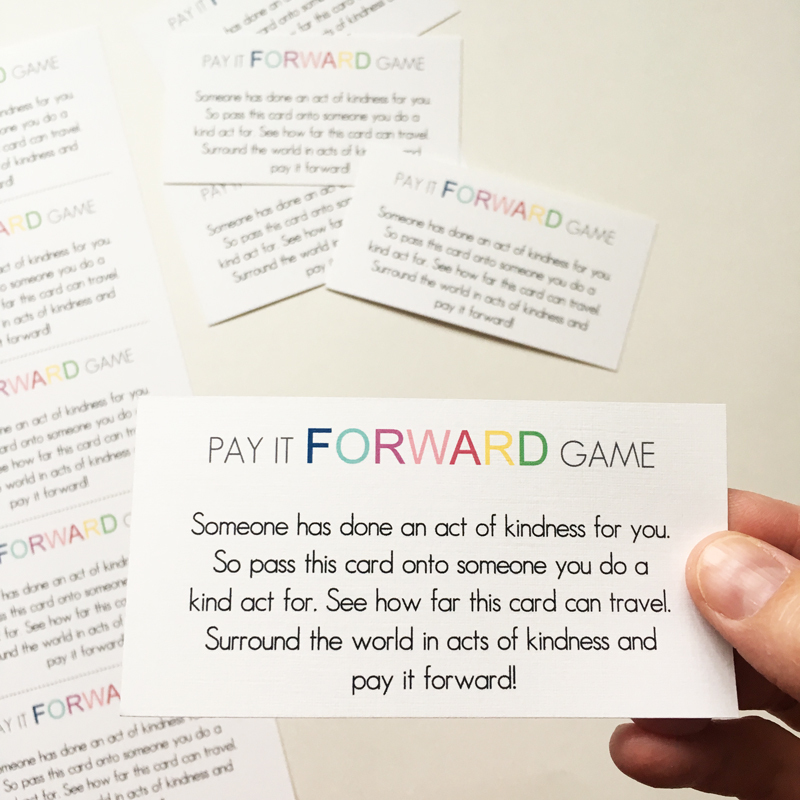 After each good deed you have done simply hand your Pay it Forward card to the recipient to do their own good deed. Help surround the world in kindness.